Sounds weird? Location Tracking and a chatbot? Yes, you heard it right. 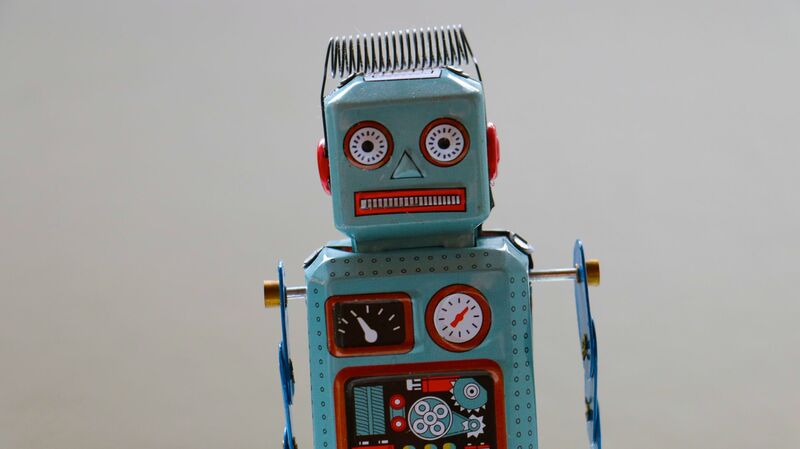 Chatbots are the new employees of software (read tech-savvy) companies. No hiring pain, No monthly salary, No 8 hours work-schedule. They work for you 24/7 without blinking an eye. We have more than 20 signups everyday on our platform and our sales team gets notified about them in real-time. We didn't want to go the conventional way of burning our engineering team's time to build Admin APIs and then the Admin console. This requires both the backend and frontend engineers engagement along with initial work by Product Managers and Designers. Being a fast-paced startup we can't afford to spend money and time without giving a second thought. This is where technology comes into picture to solve things quickly and efficiently. We decided to keep our creative juices up and go the techie way and quickly solve this problem so that it's even more optimized. 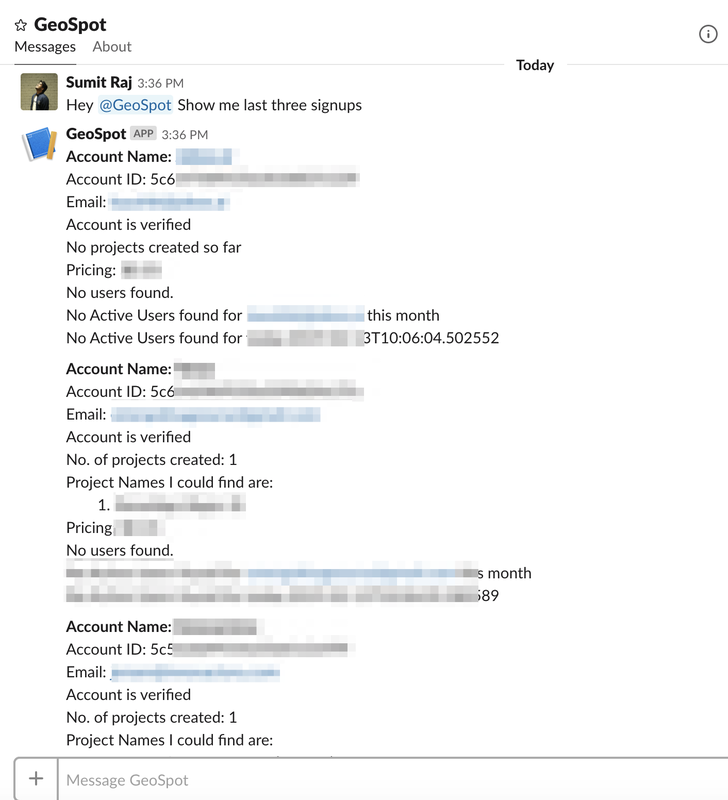 We built a slackbot and named it GeoSpot(GeoSpark + Chatbot). Our youngest hire in the team which helps almost everyone in the team to keep up the spirit. Let's talk about the problem we faced before we came up with the idea. 1) Sales team always needed to check about new signups and follow up. They needed to check if clients has created any project, apps and integration stage etc. 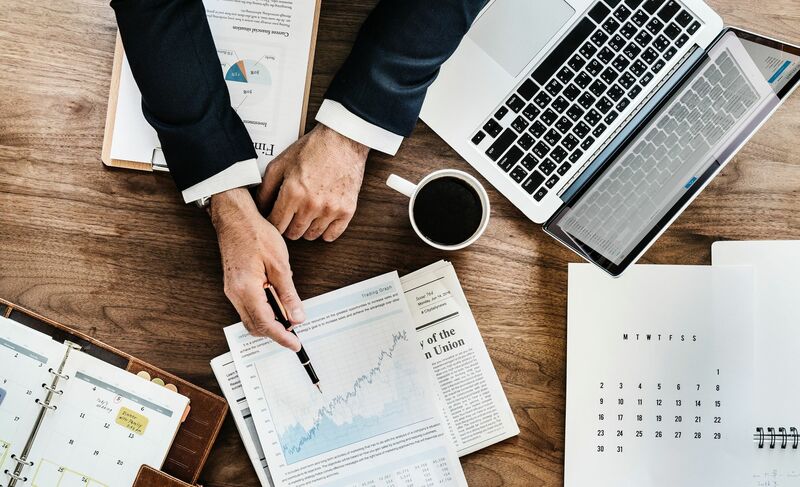 It's very important to know how much interested a client is based on what level of engagement they had with our product. Every time asking the backend team was not a solution to go with with lots of manual work involved. 2) Sales team also need to track the usage of our big clients based on their Monthly and Daily Active users. This helps them reach out to them to suggest them better customized plans and optimize their usage and cost. 3) Our engineers work round the clock to query our humongous database to get the data they want to debug issues. Be it the reverse geocoding, getting events triggered for a user etc. 4) Fun - We'll come to this part later. What we did in a span of 2 days, is to write a simple python script to pull such data and integrated it with AWS API Gateway to quickly crank up an API. We trained our bot using DialogFlow and integrated the fulfilment using AWS API Gateway to pull the specific data needed for specific use-case. Show me last ten signups and their user details. Traditional consoles load up the data even though you don't need it and it's very difficult to process it. See what we did. Alright, new signups? Want to know what they are upto? Just need the data you want? No issues, GeoSpot is not gonna do the information overload for you. 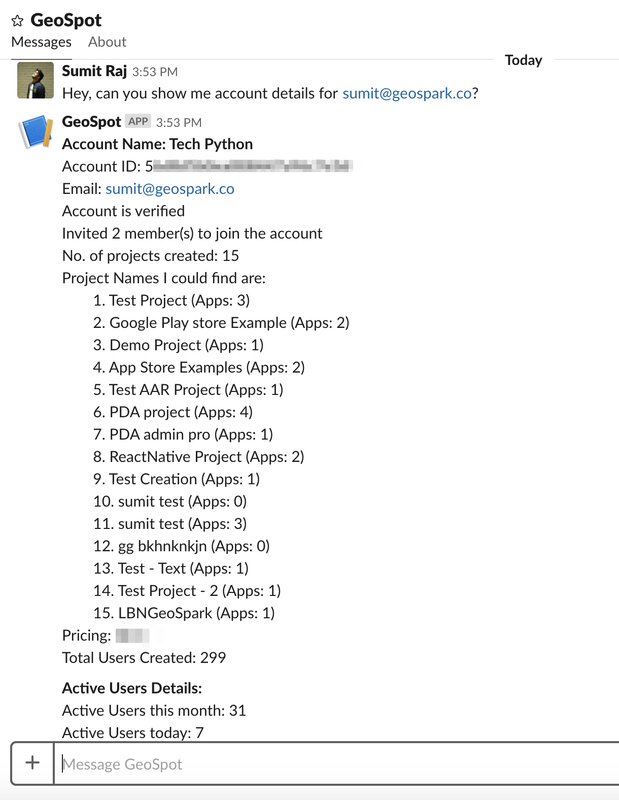 Just ask "Hey, can you show me account details for sumit@geospark.co?" and wait for the magic. Violà!!! All the details you ever needed. a) Now, coming to developers productivity. Who likes to query again and again in the database? We developers end up doing the same query during our entire tenure at an organization but never tend to store it. Well, GeoSpot comes to the rescue. How would a developer have written a query to get this data? Want to reverse geocode something ? Just ask. GeoSpot can also convert a place name to a longitude and latitude. Almost everything that you can do with location data. Now, coming to the fun part. Feeling bored? 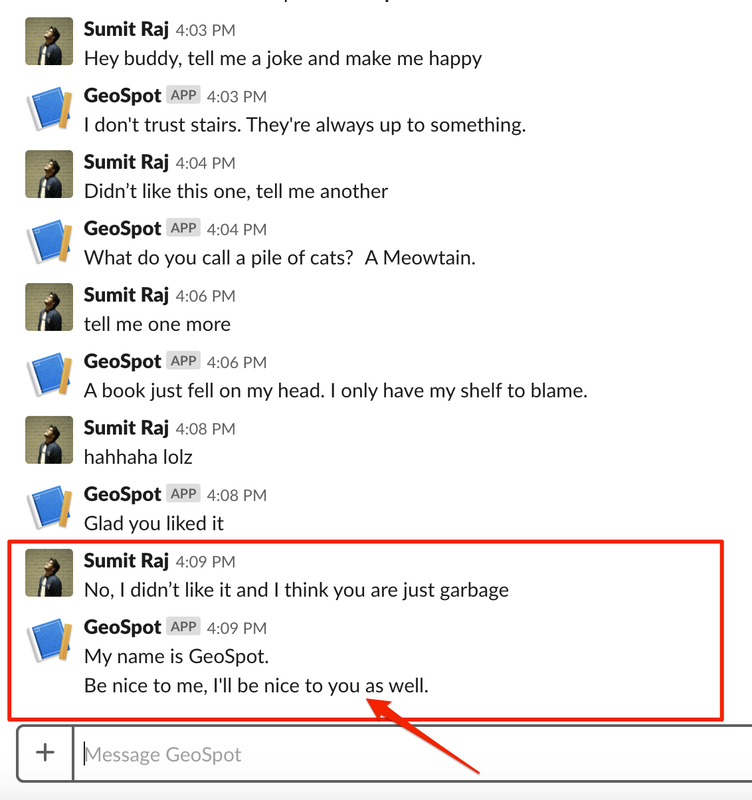 Ask GeoSpot to tell you a joke and remember not to mess with him or abuse him. He doesn't like being taken for granted. We have 500+ queries answered by this bot everyday which might have taken lots of time when manually pulled by someone. This helped us save hours everyday and be more productive as a team and company. We plan to train GeoSpot to be able to do more stuff. We can surely see it finding bugs and doing code review automagically in near future. In case you are interested in building chatbots using DialogFlow or in-house chatbots, you can buy my recently published book from Apress on Amazon which gives you an end-to-end approach of quickly building chatbots and deploying on cloud. 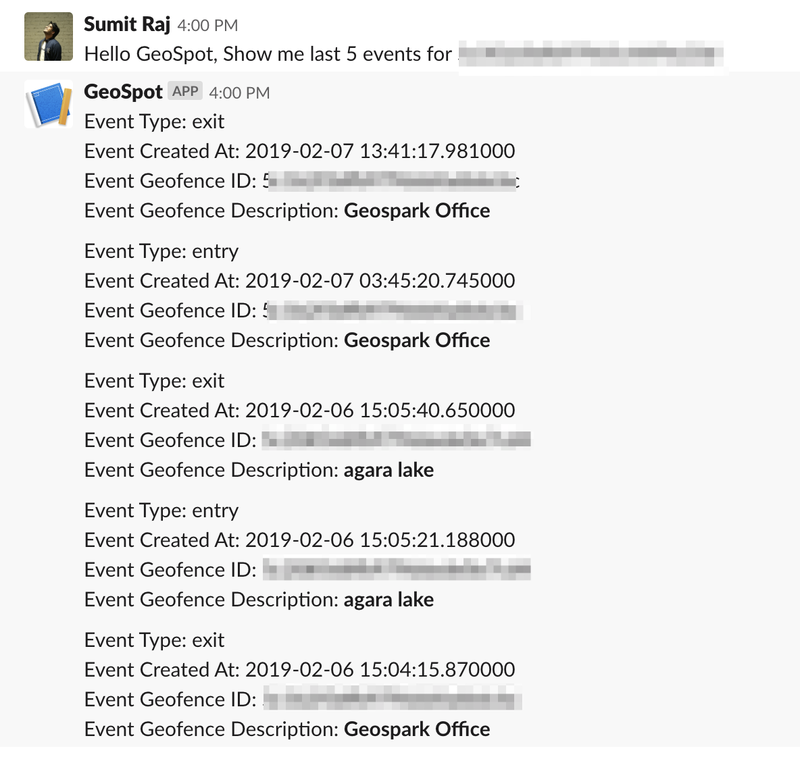 Please reach out to me at sumit@geospark.co in case of any more questions about it.